Depression is a mental illness that is defined by feelings of sadness, apathy, and hopelessness. About 1 in 5 women develop depression and it is most common in women aged 40 - 59. This is most likely due to the hormonal fluctuations experienced during menopause. 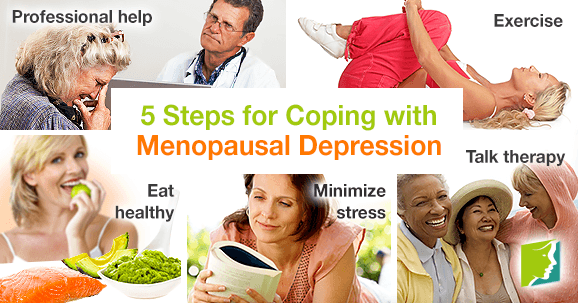 Up to 30% of menopausal women report feeling depressed during this time. Depression is typically caused by a combination of genetic, environmental, and psychological factors as well as life events. It is crucial to be aware of the symptoms and to seek professional treatment. It is important to be aware of the symptoms of depression to be able to recognize it. Symptoms of depression can be divided into two types, physical and emotional. Physical symptoms of menopausal depression can include headaches, body aches, cramps, and fatigue. Emotional symptoms of depression consist of suicidal thoughts, irritability, and overwhelming feelings of emptiness and helplessness. Hormone fluctuations experienced during menopause is one of the main causes of depression in women. Estrogen significantly affects the brain's regulation of mood. Consequently, women going through the menopause transition are at higher risk of developing depression because their estrogen levels considerably drop. Other possible causes of menopausal depression are genetics, chemical imbalance, stress, and lifestyle factors (e.g., poor diet and lack of exercise). Depression can feel hopeless. Even so, there are several ways to start countering the symptoms bit by bit. The first step of dealing with depression is seeking professional treatment. It is important to get properly diagnosed by a doctor to know what kind of depression you have and how to appropriately treat it. Doctors typically do a series of tests to determine if you are depressed and to what extent. Staying active and exercising regularly releases serotonin and endorphins in the brain, which make you feel good. Exercising also promotes other health benefits like improving sleep, increasing energy, and reducing stress. Yoga, cycling, and walking are all easy and beneficial forms of aerobic activity. Maintaining a balanced diet is essential to your overall well-being, as well as feeling your best. A proper diet should include protein, fruits and vegetables, complex carbohydrates, fiber, and good fats. Fatty acids, found in salmon and tuna, are usually low in individuals with depression. Folic acid (vitamin B9) - found in spinach and avocado - is another common deficiency in depression patients. Stress weakens the body and makes you more susceptible to pain and depression. It is crucial to try to reduce stress as much as possible for your overall well-being. Meditation, reading, and exercising can help reduce stress. Speaking to friends, family, or a therapist about what you are experiencing can help lessen depression symptoms and allow the people in your life to better understand your condition. Having a strong support system is key to upholding mental health. Unlike fleeting sad moods, depression is a constant psychological state that can considerably interfere with daily life and relationships. Depression develops over time and can be triggered by things like stress and lifestyle. It is important to seek professional treatment if you think you are suffering from depression, because symptoms can worsen if left untreated. Click on the following link to read about steps to deal with depression.